Adobe is recommending its customers to create AEM project structure using Lazybones instead of traditional Maven archetype 10. 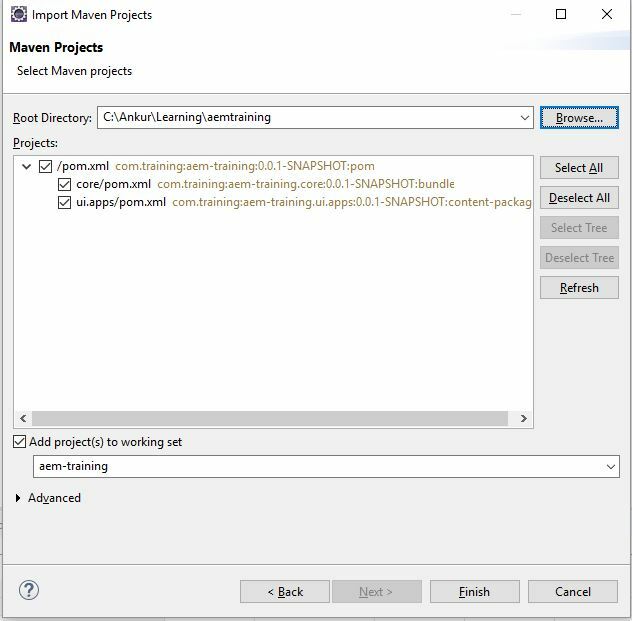 As when we create a aem project using Maven archetype it is not easy to customize, it provides lots of sample content and packages like test, launcher. Which might not be required for your project, on contrary lazybones bones is very interactive , flexible and easy to customize according to your project need. Adobe consulting Services (ACS) provides a aem multi module template using which you can create AEM projects, which includes lot of default config options and also provides an option to include the ACS commons package as a sub package. The aim of this tutorial is to learn what is lazybones and how we can use it to create an aem skeleton project structure, as Adobe consulting Services (ACS) has updated the template version and provided the support for AEM 6.3 also i am going to create project structure for AEM 6.3, for learning i am using windows machine so we are going to install lazybones on windows, but you can install it on linux and other operating systems also. Create Project Structure using Lazybones. Lazybones is a command line tool and is build in two parts. First lazybones command line tool and second project templates. This command line tool allows you to create a new project structure for any framework or library for which the tool has a template. Currently ACS has contributed one template for creating AEM multi module project, which we are going to use in this tutorial. You can also contribute templates by sending pull requests to this GitHub project or publishing the packages to the relevant Bintray repository. Go to link https://bintray.com/pledbrook/lazybones-templates/lazybones#files and the latest lazybones.zip file. currently it is lazybones-0.8.3.zip. Open command prompt and type lazybones. If lazybones is successfully installed then you will see list of available commands as shown below. Note:- If you get error like lazybones is not a command, then check environment path is configured correctly or download the package again as it might be corrupted. Press Enter, it will ask you series of questions. Enter the updated value, if you feel that you dont want default value else just keep pressing enter for default values. Note:- Here create is the lazybone command, aem-multimodule-project is acs common template name for creating the project and aemtraining is the folder/directory name where i want to create my project. If aemtraining folder is not available then it creates this folder. Click Next and Click the Browse button and select your project directory/folder, that you have given at time of generating the project. Click Finish. You should be able to see below three projects has been added to your eclipse explorer. aem-training – This project acts as the container for the two other projects. We should not use this project directly. 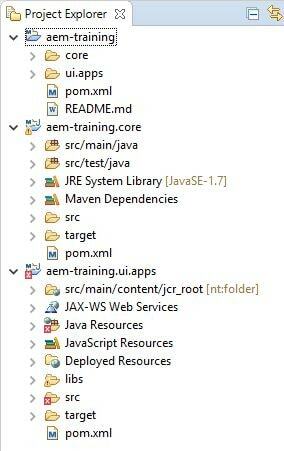 aem-training.core – This project contains Java code which will be deployed to AEM as an OSGi bundle. aem-training.ui.apps – This project contains configuration, server-side scripts, client-side scripts, and styling code (CSS). Developers used to spend bulk of their time in this project. 37 Responses to "Create AEM Project Structure using Lazybones"
Delete .lazybones and .gradle folder in under users > folder inside c drive . It should work. I am getting “archive is not a ZIP archive” exception. Instead of git bash, can u try running this command on normal command prompt. Very informative. I have followed the mentioned steps and able to project a sample project. I have tried to create a project but Its not creating the ui.app folder structure for the project. Rest everything is OK.
Do you know any possible reason? Please check if you are passing correct Content Package Artifact ID at the time of creating project through lazybones and for which version of aem you are tying to create project. You have to extract the lazybones zip file and set environmental path of its bin folder. Have you tried downloading the zip file again and extract it. i have downloaded and have extracted lazybones-0.8.3.zip. I have set path path to bin location. On which operating system, you are running it. i have changed maven version to 3.3.9. I use Windows 10 and JDK 1.8.0_131. I have same issue as posted earlier. Same artifacts used as in article. ui project is not created, When I try to import project in eclipse, ui project does not show up only core is showing up. It seemed that Bintray wants a username and password. I’ll be posting this in the Github issues queue. 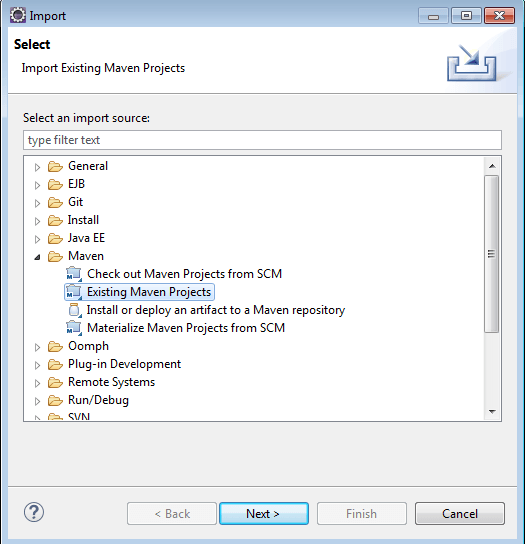 I created the project successfully but when I go to import the project in eclipse using “existing maven project ” Eclipse is giving an error “path for project must have only one segment”. Can you please help? I am facing issue how did you solve that. I have eclipse neon installed on my machine. Hi I tried to create an aem project using lazybones, everything worked fine but only ui.apps and core package is being created but I need ui.content package as well. Please let me know What could be the possible reason for this and how to solve it. Because we have requirement to check-in content(site pages and dam) as well. Could you elaborate how it is more flexible than maven archetype. I understand maven generates more modules… Other than that, what is the downside of maven archetype compared to this? Are you specifying template name, can you share the command that you are trying to run. Also:- Please let me know your java and windows version. Have you tried creating outside users, like under c://training(Create a new folder training under C). As mentioned below, could you please try to run this command under any other folder that you have created. Cannot create a new project when the template isn’t locally cached or no version is specified. I am using windows 10 with java version “1.8.0_101”. What could be the issue, could you please confirm which version should I use in template though version is not mandatory, which may solve the issue ? Awesome Article Ankur! Is there a way I can add more modules like ui.config to the sample project? I can only see ui.apps and core got created with this. Could you please point me to a probable reason ? 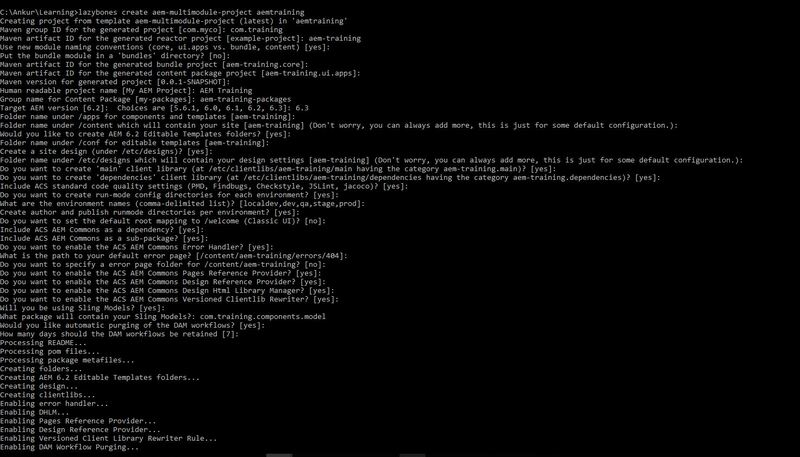 Can you please try running this command lazybones create aem-multimodule-project 0.0.38 aemtraining. Just FYI 0.0.38 is latest aem-multimodule-project version, it is a optional parameter. By the error it seems like it is looking for template version in your case. Just try passing this as well. Good one! If possible update this in the article as a note. It’s hard to see this solution in comments. So a connectivity issue across the board? Do we have a problem with our proxy? Also followed up on the below suggestion you gave, but nothing worked. Still facing this error – Cannot create a new project when the template isn’t locally cached or no version is specified. I extracted the lazybones zip file from the link u gave and set environmental path of its bin folder too. I could see many people facing the same error but nobody was able to provide a solution to it really. Iam not able to figure out why I’m getting that error. Can u suggest something?